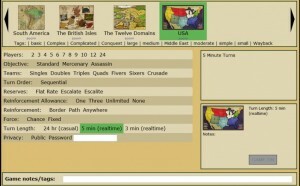 The game clans feature of Major Command Risk has largely been behind the scenes and only available to staff. Well, no more. We are opening it up to strategists and commanders. We don’t have any huge plans for game clans just yet, but we just want to see what happens when they are public and open. Is there enough demand for a formal clan league? We will see. What are the Game Clans about? At the basic level, a clan is a group of players who are identified together. They may be veterans, people from Ohio, real-time players, or just a group of guys and gals who want to dominate other players and clans. Clans will get their own clan page and also their own private clan forum where only clan members can see and post. There are two types of clans. Social and Competitive. 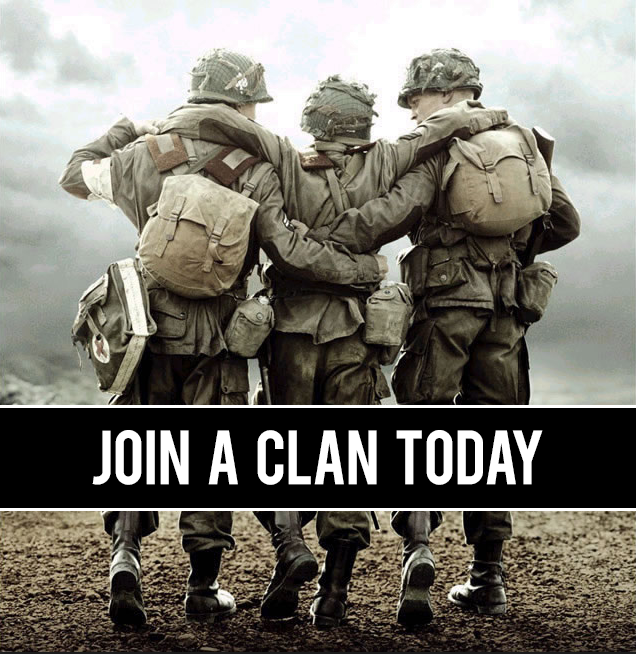 If you are just looking for like-minded compatriots to hangout and play with, a social clan is for you. If you are looking to be ‘on a team’ and compete, then you want a competitive clan. You can be in multiple social clans at the same time, but only one competitive clan at the same time. Where do competitive clans compete? I’m not sure yet! This, like any new feature, is a test. If a bunch of competitive clans form, then we can set up some sort of league. Consider this a clan beta! There may be bugs or issues with the clans as they have not been extensively tested. Please let us know of any issues at first. You can also let us know of feature requests, but they may not be a priority. Requirements to start a clan! Four members minimum to start. These members must have agreed to join prior to application. If you can pull those together, click this link to get started. All clans must be approved by the Clan Director… which for now is me, Badorties. If you have any questions, just ask in our forums. So a feature that hasn’t gotten a lot of attention is the Honor system which is rating you by honor points. You can find the number of your honor points on your Major Command profile. It is designed to be a score how you play in terms of your behavior. It should highlight honorable Risk players and warn of dishonorable players. That’s how it’s supposed to work, but in order to really test it, we need to put it through its paces. So watch the video below describing how it works and how to use it. Then get on rating! Your honor points are calculated like this. The first number is the percentage of honorable votes. The second number is the total number of votes, honorable or dishonorable. So a score of 80 (17) means 17 people have rated you, 80% of them were honorable. Any questions, just ask. There is also a few threads in the forum about it. So our latest Risk game updates contained a bunch of new features, but there are a couple big ones that are worth more ink. 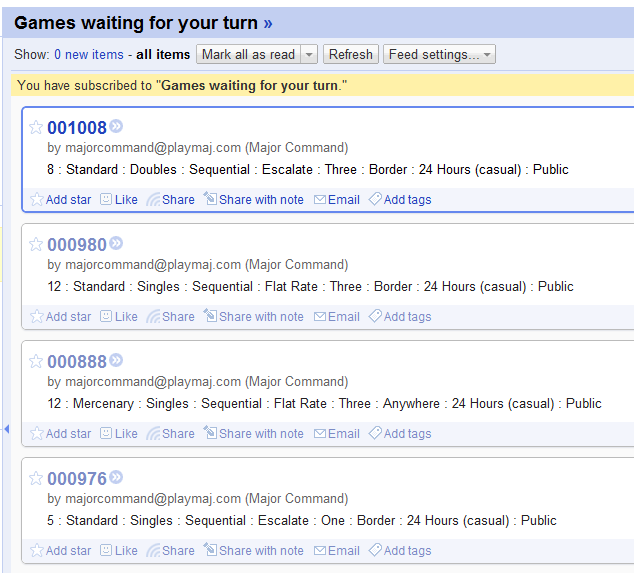 We noticed that while we get a steady stream of new users to Major Command Risk, many didn’t stick around. After some analysis, we found that there were three main factors. 1, Expectations were not set properly. 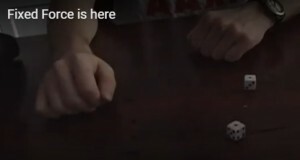 2, Users didn’t know what it was their turn for RT games. And 3, users would get into games with complex settings and get slaughtered. So for the first issue, we revamped the new user entry process, provided some helpful videos, and also made sure there were ample places where information could be found. For the second issue, we have a turn notified that will slide out when it is your turn and you are on the site. Meaning you can join an RT game, go to the forums and this little slidey thing will let you know what its time to get your boots on. It’s not perfect and still in stages of development, but should be a vast improvement. The turns indicator in your dog tag is also real time, meaning you don’t have to refresh the page to update it. We’ve also added a few lines of text in key places to let new users know what’s going on with RT games. For the third issue, we created theme games. These are games that appear at the top of game results. They might say “New Players Welcome“. They are permanent games and when filled, will automatically respawn to be filled again. They use beginner settings that new players can get their feet wet in. If you are a vet and join of these, be friendly and honorable. In the future we will create theme games for new maps or other settings we want to feature, so keep a lookout. There are lots of other small tweaks to the system, but those are the major Risk game updates concerning new players. One final note, all users who were free strategists during beta will be reverted back to grunt in the next 48 hours. We got to pay those hosting bills and hope you continue on with us. The near future is brimming with new maps and features and you certainly want to have some room in your game clip. Fixed Force setting is here. Testers wanted! Fixed Force is a Risk game setting that removes chance from the attacking phase. Are you tired of getting killed by horrible luck? Can’t stand the cold rolls? Then Fixed Force Risk game setting is for you. So I am quite excited to announce that Fixed Force is now being tested on DevCom. Attacks are 1 for 1. Both the attack and defender lose 1 troop per attack. You need 3 troops to make an attack. A 1 provides no defense. The attacker can defeat a 1 without losing a troop. We are looking for committed people to put this feature through its paces by playing fixed force Risk game settings on the DevCom server. To sign up, go to the DevCom clan and just send the admin a note. To get a better sense of what this is all about, watch this totally awesome first episode of the Major Command Risk Special Ops podcast! Remember guys. Fixed Force is a Risk game setting that removes chance from the attacking phase. If you’re tired of getting killed easy and can’t stand the cold rolls, then Fixed Force Risk game setting is right for you. From this moment on the Fixed Force setting is available for testing on DevCom. Keeping up with a lot of turns can really fill up your email inbox. Or sometimes a turn email can get lost in the fray. Now there are two new ways to keep on top of your turns. Then just paste that into your RSS reader and you will get something like this (google reader). You can click any of those numbers to take you to the game. 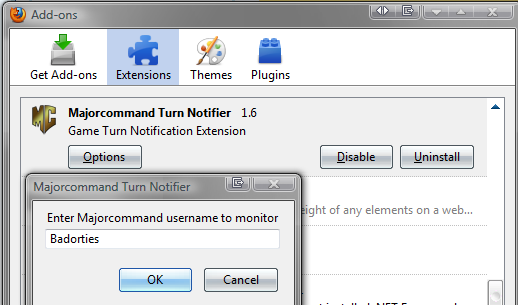 After you install it, in Firefox go to Tools >>Addons >>Extensions and click Options on the Notifier. You can then put in your username, like so. After this is done, you should see a small grey or yellow square in the bottom right of your Firefox window. Grey means you don’t have any turns. Yellow means you have a turn to take. And clicking the icon will bring up a list of your games. Cool! Great work by Evan and Codanostra on these features so be sure to give them a pat on the back. There is an official support thread here.